Sydney has a prolific problem with wood worm. 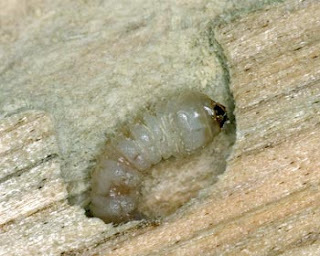 Borer or (woodworm) can really devastate timber in your home. They particularly like floorboards and once the damage becomes evident, it's time to replace the timber before the breeding cycle starts over. wasn't able to buy Kawrie (Dammara Australis) boards for these small repairs as there are hardly any of those trees left! 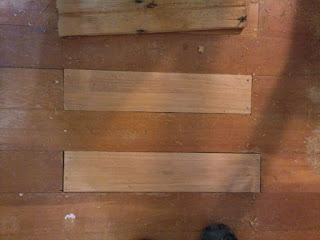 At a trip to the local timber yard, I matched the colour, thickness and width with my sample piece of board. The client will get the whole room re-sanded and varnished so these new additions should blend in quite well. 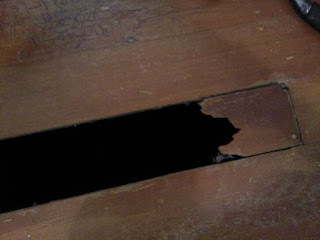 Now that the damaged boards are replaced, it's nice to know that the floor is safe for years to come.